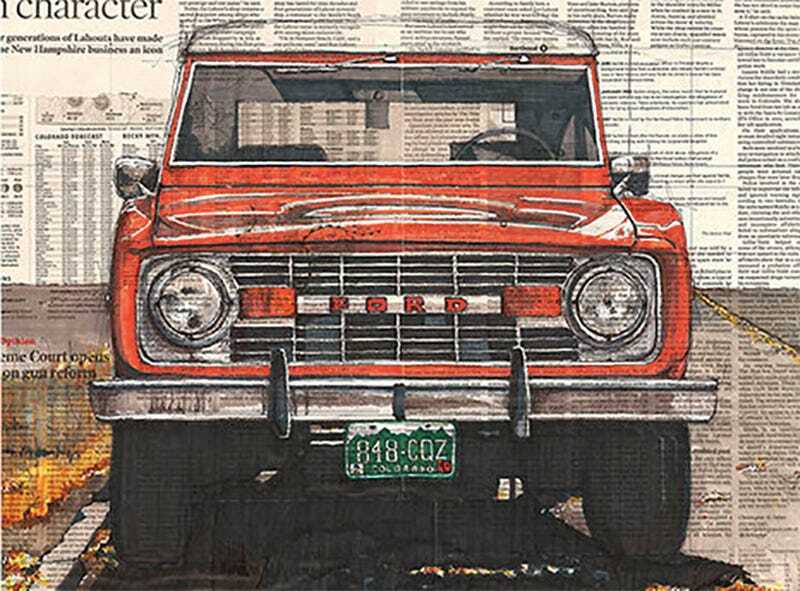 Like many of us, Colorado architect Adam Ambro makes car doodles on newsprint he’s done reading. But his are pretty enough to frame. Ambro e-mailed me out of the blue, simply saying he thought I might like some of his art. And indeed, I think he’s got my number. It’s all hand-drawn pen and marker illustrations of cars, motorcycles and trailers on the classified section of newspapers. What’s not to like? The vintage feel of this whole concept really feels like it matches with the subject matter, which you’ll see is mostly “old adventure vehicles” when you paw through Ambro’s gallery. As you lean in to inspect the details of the drawing, you get little snippets of the stories and classified ads it was scribbled on. I feel like this makes the work seem more historically significant, even if the “stories” that show through the ink are arbitrary and inconsequential. “Slice of life” stuff, I think I’ve heard it called. Yeah man, I’d drive any of these to the end of the Earth. Ambro explained to me that he does each illustration by hand himself, with “layers of pen, marker and whatever else happens to be within arm’s reach,” then scans and reprints so folks can buy them. Always neat to see talent and creativity applied to things we care about– old cars—in a new way. Hey Adam, can you do a Scout II next, please?